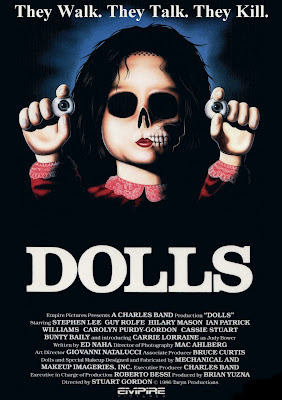 The Rockport Film Review: Evil Doll Movies #1 - Stuart Gordon's 1987 film "Dolls"
Evil Doll Movies #1 - Stuart Gordon's 1987 film "Dolls"
When it comes to the horror movie genre there are several well known and defined sub-genres. You got your slashers, aliens, vampires, werewolves, supernatural and numerous others. For the next few reviews, I will be focusing on the Evil Doll movie. The biggest and most notorious of these is the “Child’s Play franchise.” Chucky the Good Guy doll has become a household name when it comes to diabolical little toys. There is also the vast collection of “Puppet Master” films produced by Charles Band. One of the more recent (and forgettable) of these is “Dead Silence”. These movies are effective when they can prey on the primal childhood fear of your toys coming to life to kill you. But with any movie in any genre, you need a good story and good characters. 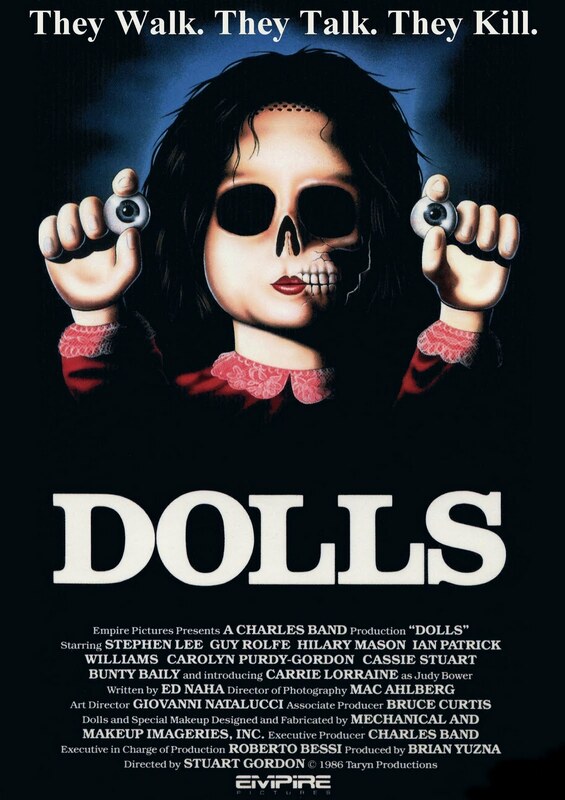 For this review, I watched “Dolls” by Stuart Gordon. Gordon’s first film “Re-Animator” is a cult classic that is a must have for any horror fan. “Dolls” is a very short 75 minutes and any longer would really be too long. This is not a great movie, but there are a few gems within its short life and as a whole, it falls rather flat. In the time before CGI, these numerous dolls were all meticulously handcrafted and brought to life (and death) through stop-motion animation. The animation scenes are really pretty cool and by far the best part. The acting is absolutely dreadful, except for maybe the seven-year-old girl. The story is also rather weak. A family is traveling a deserted road when a pothole blows out a tire. They seek refuge in a big scary old house inhabited an old doll maker and his wife. A few other characters pop in along the way including two punk rock teen girls seemingly pulled straight from a Madonna video. The many dolls throughout the house look pretty creepy as it is until they start moving their eyes. After everybody goes to bed the dolls come out to play. Like a said before the plot is pretty thin and most of the characters are around only to be victims. If your feeling nostalgic for 80’s horror gives this a shot.